If you are in need of a great Irish comfort food recipe for Saint Patrick’s Day, then here you go! 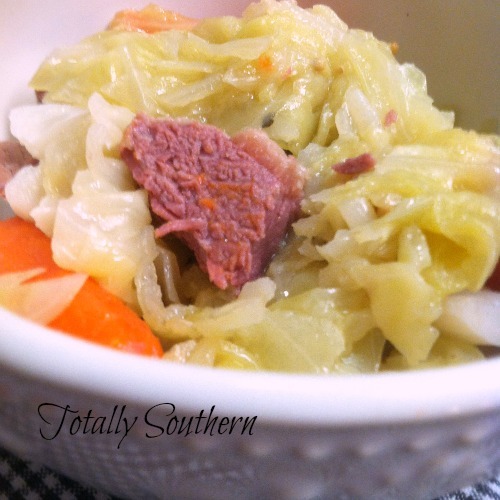 Corned Beef and Cabbage is a delicious, one pot meal that is really simple to make. It may take a little time…but it is oh, so worth it! You must have a taste! 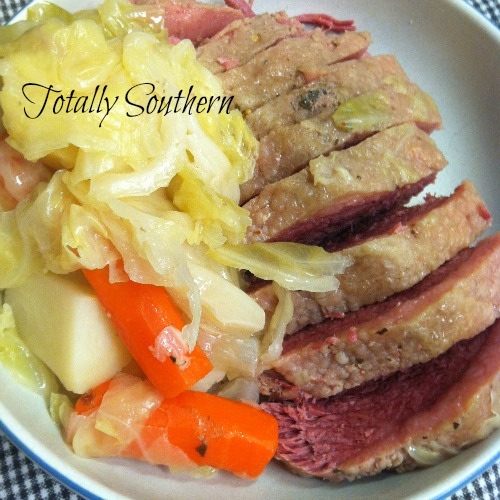 Corned Beef and Cabbage is also referred to as New England Boiled Dinner. It is a warm bowl of hearty, savory flavors. Corned Beef and Cabbage is an American version of the genuine Irish dish of Bacon and Cabbage. You could serve it with Irish Soda Bread, but here in the South we like a big cornbread muffin to make our meal complete! We also like to have a big glass of sweet tea to wash it all down! 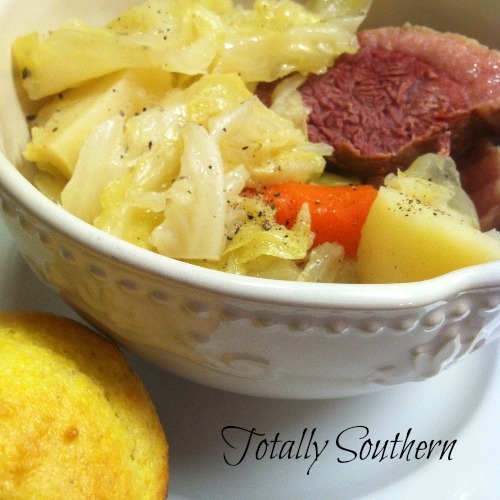 My version is adapted from Better Homes and Garden’s New England Boiled Dinner Recipe. 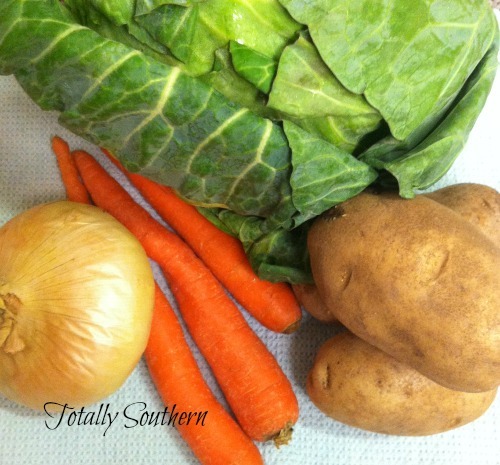 Here is the recipe…just in time for Saint Patrick’s Day! Green for St Patrick’s Day! 2-3 pound corned beef brisket (get the one with the little seasoning packet). Note: corned beef brisket is sold in two varieties, point cut and flat cut. I prefer the flat cut because it is more tender and slices easier. Trim most of the fat from the meat. Be sure to leave some of the fat for added flavor. Place the meat in a large Dutch oven; add the seasoning packet and fill with enough water to cover the meat. Add the potatoes, onion, and carrots to the meat and cook for 15 minutes. Add cabbage. Cover the pot and continue simmering for another 20 minutes. (Check after 15 minutes for tenderness of veggies. I like to cook them until soft). Remove meat and thinly slice across the grain. Place meat and veggies on a serving platter or in a large serving bowl. Serve in individual bowls. Let your family or guest garnish their bowl with a splash of vinegar and/or hot sauce (we like both). You may also want to add a little salt and freshly ground pepper. You could make this dish in the crock pot. Just place the meat, seasonings and about a quart or so of water in slow cooker with onion, potatoes and carrots. Set to cook on low for 6-8 hours. Remove lid and add the cabbage. Replace the lid and cook for 30 minutes to an hour. Proceed as above in the directions once the cabbage is done. Do you make a special dish for Saint Patrick’s Day? If not, you might want to start a new tradition. 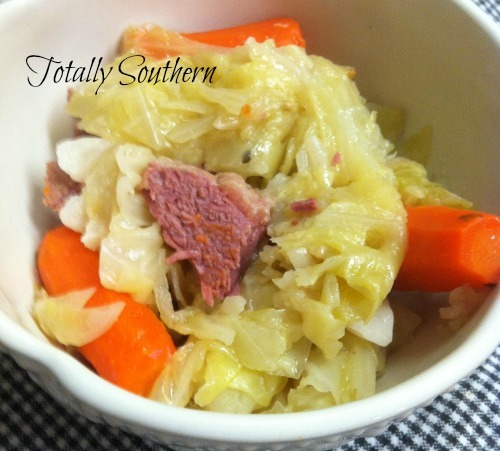 Give my recipe for Corned beef and Cabbage a try! March 17th is Saint Patrick’s Day. Don’t forget to wear something green!